Its time to put those spreadsheets down and track time like a pro. Built to boost your productivity. Research shows that businesses lose a staggering average of 15% to 30% revenue in unlogged time-entries. Stop wasting time and money today. Stop micromanaging your teams and start focusing on running and growing your business. Invoicing your clients for tracked time and expenses is no longer a tedious chore. You’ll finally enjoy this mundane task. Powerful and invaluable data insights that guides sound business decision making. Powerful features to help you better manage your projects, teams and tasks. Hypelogs notifications ensure your business is running like a well oiled machine. Harvest & Toggl import and many other features such as QuickBooks and Asana integrations coming soon. Customize your account settings and tasks based on how you run your business. Hyperlogs is designed to be accessible via with any device, desktop, mobile or tablet. Hyperlogs features are all enabled for everyone, whether you are on the free or business subscription plan. 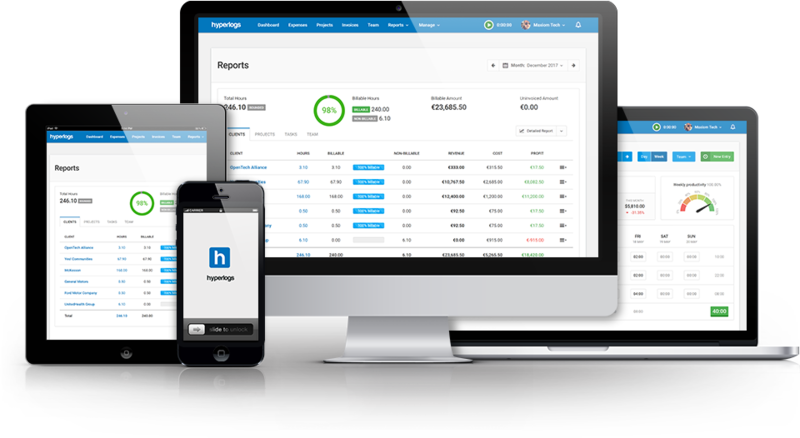 Hyperlogs support representatives are standing by to help you setup and run your business like a pro. Join over 1,000 companies that trust Hyperlogs. Try it yourself absolutely free. No credit card required!